So, finally it has made the headlines. After many years of me talking about it, finally the reality was reported by mainstream newspapers few days ago. When many of us in the medical line brought up the issue of too many medical schools and too little training position, we were condemned. This is partly because the government itself, till 2014 denied that such a thing will happen. For those who know our government very well, surely know that not all said are trustable. Despite overwhelming evidence, people refuse to believe. As I had always said, people would only want to listen to good stuffs. When I tell them the truth and reality, I am accused of discouraging, very negative etc. No job is going to be guaranteed….. The only difference is , you will be spending RM 300-600K for a medical degree locally! On 19/01/2017, The Star as well as Malay mail published an extensive report regarding contract HO post and no guarantee of a civil service post thereafter. Since I wrote about the contract HO post in November 2016, a Malay mail reporter was trying to get in touch with me to get my views on the issues. However, I did not respond to her since I was overseas till mid December 2016. She contacted me again few days before the articles were published and I gave my views. She was more interested about the JPA scholars. She wanted a copy of the contract which I refused, as the doctor’s name is written on the contract. As usual, all these happened because there is no such thing as “planning” by our ministries. Each ministry works on its own without proper consultation with other ministries. For Ministry of Education(MOE), their goal is to make Malaysia an education hub, quality aside. It is a money-making business. My stand has always been that education should never be commercialised! License to start medical schools were given like peanuts. Only in Malaysia, colleges in a shop-lot can be given license to run a medical program. Accreditation works on minimum criteria and not based on an expected standard. As long as the college achieve a minimum standard, they will get the green light to continue. It’s like saying, 20% is enough to pass. You don’t need 70% to prove you are good and excellent. MOE treated medicine just like any other educational program! Medicine is not like any other course. The 5 years undergraduate program is just the beginning. It is a life long learning. You learn by apprenticeship. You are dealing with life and death mater. A simple prescription error can cause a death! Training can only be done in accredited training centres. Many parents live in a delusional world thinking that jobs for doctors are guaranteed. The fact is, not anymore. Even in countries like US, UK, Australia etc, doctors work on contract basis. However, most of these countries have enough internship post for their graduates, due to proper planning strategy. Apart from internship, there is no guarantee that you will get a permanent job. Some survive by doing locum. Malaysia is now entering the same situation. And don’t forget that if your degree is not recognised elsewhere, you can’t work in another country without first sitting and clearing their qualification exam, with no guarantee of a job. This will cost you more money! From the newspaper report, it is also obvious that all HO post will be given under contract basis from now onwards, even for JPA scholars. Permanent post is only eligible after you complete your housemanship and there is no guarantee that JPA scholars will be given a permanent post. As I mentioned earlier, this is good to kick out the poor performers and retain the best in civil service. However, the selection process must be transparent. If not, many accusation will be floating around in the next few years. Please be informed that if you do get a permanent post after housemanship, you have to go where the post is vacant! You cannot choose or appeal. If you don’t want to go, someone else would be willing. You can’t choose where you want to work. You are also not eligible for car or house loan from the government if you are not holding a permanent post. Even bank loans can be a problem is you don’t have a permanent job. With 32 medical schools and close to 38 medical programs, oversupply of doctors is inevitable. As of 31/12/2015, based on MOH statistics, the doctor : population ratio is already 1: 656, not including doctors from non-MOH public hospitals. So, we are already 2 years ahead. Chasing after numbers do not make any difference. Quantity does not equate to quality! Well, I had spoken enough about these issues many times before, including in my books that was published last year. So, I will not repeat it all over again. It is time for medical graduates to look for other jobs. GP market will be flooded in few years time and as I had mentioned in my last article, unethical practices will become a norm in the name of survival……..
Gong Xi Fa Chai everyone…………..
KUALA LUMPUR, Jan 19 — Permanent positions will be offered to contract house officers depending on their performance rather than any government scholarship they may or may not have received, the Health Ministry said today. Health director-general Datuk Dr Noor Hisham Abdullah confirmed that the government started the first intake of contract housemanship last December 5, with Public Service Department (PSD) scholars among the graduate doctors on contract as no permanent positions were offered at all. “If you are competent and good, then no worries. Those non-performers and MIA [missing in action] should be worried as it’s based on merits. For this, anywhere you go it’s the same — public or private. “Who wants to employ incompetent and missing in action doctors?” the Health DG said. Dr Pagalavan Letchumanan, a consultant physician and rheumatologist, said he was made to understand that 1,300 contract housemanship placements were given out, including for PSD scholars, after the last Public Services Commission of Malaysia interview in October 2016. “There is no guarantee that you will be continued to be employed just because you are a PSD scholar! This comes as a surprise even to me as the scholarship contract specifically says that you will be bonded with the government for 10 years,” Dr Pagalavan posted on his bloglast November. “What happens if the scholar is not able to get a permanent job with the government? Does he need to pay his bond? An interesting question,” he added. Dr Pagalavan told Malay Mail Online that a PSD scholar had told him that he was given a contract post and was informed that the government bond was between the scholar and PSD, and had nothing to do with the Health Ministry. Among the criteria listed on the house officer’s contract for the offer of a permanent position, “depending on the availability of positions”, were completion of one’s housemanship, a good track record and a recommendation from the head of department. 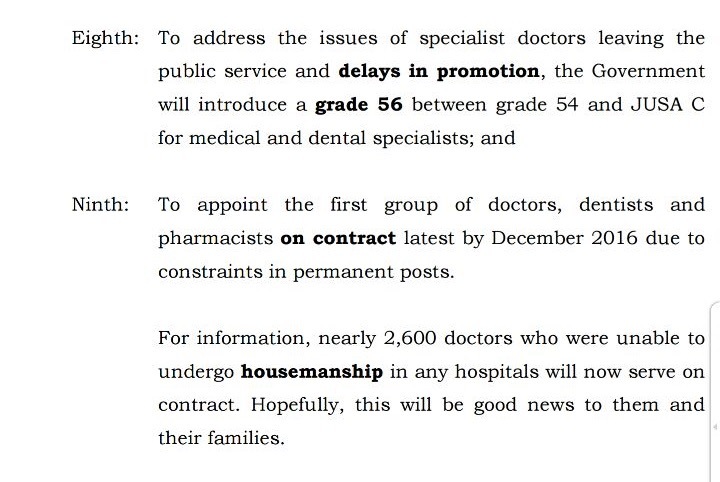 The copy of the contract that Dr Pagalavan posted on his blog also stated that the government could terminate the contract at any time if the house officer’s performance was not satisfactory and that a 30-day notice, or one month’s basic salary, would be given. “Somehow, I feel this will remove all the dead wood graduates from the system. However, I am also worried about lack of transparency in making such [a] selection,” Dr Pagalavan said, adding that a committee should be formed to ensure that such decisions were fair. Malaysian Medical Association president Dr John Chew claimed that before the implementation of the contract housemanship system, 20 per cent of doctors holding such posts were not performing. “So the new system will be better,” Dr Chew told Malay Mail Online. “For most of us, employment and work are more important. Most people are happy that they have started work”. EXCLUSIVE: PETALING JAYA: Permanent employment for doctors, pharmacists and dentists in the civil service is no longer guaranteed. The Government has started issuing jobs on a contract basis for them since last month as announced in Budget 2017. According to the Health Ministry, if doctors successfully completed their housemanship within the three years of contract, they would have another two-year contract for compulsory service as a medical officer. Pharmacists will be hired as provisionally registered pharmacists (PRP) for one year, with a maximum contract offered for two years and for the compulsory service thereafter, one year, with a maximum contract offered for one year. There is no compulsory internship for dentists and compulsory service for them is one year, with a maximum contract offered for three years. Health Ministry secretary-general Datuk Seri Dr Chen Chaw Min said from last month, 1,219 candidates had been offered jobs on a contract basis by the Public Service Commission. “Permanent appointments will be based on their merit during housemanship training and recommendation by the Health director-general,” he said in an e-mail to The Star. The move, he said, is expected to reduce waiting time for housemanship training and compulsory service. Dr Chen said competent staff who fulfilled specific requirements will get permanent posts but they may not immediately get the posts until there are vacancies. Their salaries will be backdated to the date of appointment once the posts are available, he said. He said for government scholars who have not been offered permanent posts in the ministry upon completion of their compulsory service, they could seek jobs in the university and military hospitals and the private sector. He also said that for this year, the ministry planned to take in 9,300 candidates – six batches of intakes which will involve 5,425 candidates for house officers (housemen), three batches (1,921) for dental officers and four batches (1,954) for pharmacists. He added that housemen will enjoy the same benefits received by permanent house officers as stipulated in a 2008 circular on contract of service with additional advantages. Those under this “modified contract” will have full-pay medical leave up to 90 days, and the extension of medical treatment for parents in government hospitals and clinics, he said. But only those who are appointed as permanent medical officers and have obtained their confirmation in service are eligible to apply for government housing loans, he said. The monthly basic pay of a houseman is the same as the grade category UD41 of the permanent service which is RM2,947, while a dentist (grade UG41) gets RM2,844 and a pharmacist (UF41) RM2,740. With allowances, they could get RM4,000. On the criteria for a permanent medical officer post, Dr Chen said doctors must fulfil the service requirements, including attaining a good level of competency and performance of at least 85% in the yearly performance review during their house­man­­­ship training or compulsory service. The permanent posts would also be given to the best talents who have the potential for specialty training and are willing to serve at any place in the ministry’s facilities during their tenure, he added. For Future Doctors: Desperate Times, Desperate Measures……. Unfortunately, doctors were in the limelight for the wrong reasons towards the end of last year and the beginning of this year. A daring expose by Al-Jazeera regarding baby selling syndicate in Malaysia on 24/11/2016 was a disaster for doctors. The faces of many doctors involved were clearly shown. Unfortunately this is nothing new. Many years ago, a similar syndicate was exposed and caught in Johor. The police acted swiftly and did manage to arrest few of the members of the syndicate that was exposed by Al Jazeera. Just when we thought it was already damaging enough, came another exclusive expose from NST. Doctors venturing into unethical practices of cosmetic products. Frankly, this is nothing new as well. I have seen enough doctors practising what was exposed by the report. Injecting IV Vit C for whitening/anti ageing and many more so called aesthetic practices are common nowadays. In 2012, MOH (tr-vitamin-c-injection) had already issued statement that there is NO evidence that IV Vit C has any benefit. In fact, ViT C is NOT approved by MOH for intravenous injections for cosmetic reasons. Anyone found doing it can be charged for unethical practice. Ozone therapy is another major complimentary medicine practise that doctors are widely involved. Way back in 2011, MMC had already issued a statement that ozone therapy do not provide any health benefit and any doctors found guilty of providing ozone therapy by claiming that it can cure diseases, can be charged for unethical practices. Unfortunately it did not prevent many doctors from doing it. In fact I even know nurses who are openly promoting such centres on Facebook and showing many VIPs who are taking their ozone treatment. Again, on 3/01/2017, our DG issued another press statement regarding ozone therapy. The press statement came after NST reported that many celebrities who were openly promoting ozone therapy for advertisement purposes expressed their regrets. I have heard of reports of people dying during the procedure and even developing cardiac and renal failure. It is not a procedure without complications. The question is, why are doctors venturing into such practices? The answer is simple : money and survival! Since I started blogging in 2010, I had written several times regarding these issues. In fact in 2012, I wrote on how desperate have doctors become. That is the reality out there. No matter what passion that you talk about before going into medicine, at the end of the day, it all boils down to money and survival. There is no such thing as easy money or easy life in medicine. Many doctors especially GPs are struggling to survive. Thus, to keep their income and their clinic running, they venture into these unethical businesses. I get a lot of query regarding aesthetic medicine etc. My reply has always been to ask yourself why you became a doctor! Is it to treat and cure people with sickness or to become a glorified beautician! Yes, there is a lot of money in aesthetic medicine. There are huge financial backup from big suppliers all over the world. Cosmetic and aesthetic suppliers are one of the largest companies in the world. The companies need doctors as doctors are the only people licensed to inject substance into a person! At the end, no doctor will do it if not paid well! The situation will only get worst. My last article talked about the introduction of contract HO post with no guarantee of a permanent post. I had mentioned that those who do not get a permanent post will end up flooding the GP market. Imagine what will happen then. Issues mentioned above will only get worst day by day, in the name of survival. WE have to blame ourselves for loosing the respect and trust once given by the public. Worst still, many of these young doctors would have huge amount of debts to pay! As I had always said, never take huge loans to do medicine! Well, it did not end there. Just when 2016 was coming to an end, 2 cases of botched circumcision were reported. Interestingly, the first clinic was reported as not having a license to run! Interesting indeed if the report was true. For Future Doctors: BUDGET 2017, as reality hits……….. I have been very quiet over the last 2 months. I am sure those who are in the private sector(specialist) would know the reason. All of us are undergoing a huge heartache due to a change in the policy of LHDN/IRB to disregard any income declared under our own company (Sdn Bhd). For those who do not know, private specialist are independent contractors in a private hospital. We are not paid a salary by the hospital, thus we are not employed by the hospital. Basically, our income is the fee paid by the patient as what we charge, based on PHFSA act minus 10-15% administrative fee by the hospital. Our fees are limited by the government BUT not the hospital charges. Thus, to manage our tax better, we form our own company where the income is channelled. This practice has been going on for close to 30 years since private hospitals started in this country. Unfortunately, as the government tries to get more income from taxes, the rule has suddenly been changed. Effective mid of this year, a letter from IRB has declared that all income generated by a specialist in a private hospital MUST be subjected under personal income tax! AND it does not end there, we are being asked to redeclare our income tax from 2013 and pay the penalty for the difference not paid! AND we have to do that by 15/12/2016 to receive a reduced penalty rate of 15-20% under the amnesty period introduced by PM from March 2016. Now you know why I was very quiet over the last 2-3 months! The penalty and tax arrears can cost hundreds of thousands of our hard-earned money, working day and night. Coming to our Budget 2017. In August 2016, I wrote about the soon to be introduced contract HO post to reduce waiting period for housemanship. Well, it has been confirmed in this budget. 2600 contract post will be created by December 2016 to cater for the shortage. He also mentioned that contract post will also be created for dentist and pharmacist but that is nothing new as it has been done. Unfortunately, the budget is silent on what happens to these contract post after they complete housemanship. Will this shorten the waiting period? Personally I don’t think so but it may shorten by 1-2 months for a short period of time. Always remember that starting from this year (2016), ALL medical schools in this country will be producing graduates and those who started to produce graduates about 4 years ago will be producing maximum number of graduates from this year. Another question is how they will select candidates for permanent and contract post? My prediction: probably government sponsored and public university graduates may be given preference and those who do well in the interview might be given priority as well. What happens after you complete housemanship? MO post are also FULL! Another interesting development is the introduction of a new grade for specialist known as Grade U56. As we all know, since the time based promotion was introduced in 2010, there is a bottle neck at U54 as all specialist of 9 years of service will be automatically promote to U54. Unfortunately, no JUSA C promotion has been coming since the last 2 years as there are not enough post or money to do that. Thus, the creation of U56 is to relieve the anxiety among all these specialist and to encourage them to stay. I know many U54 and even JUSA C specialist resigning from government sector but with the recent IRB ruling as above, private sector may not be as lucrative as what you expect it to be. You will end up paying 26-28% of your hard-earned money to the government. You will be working 3 months in a year for the government. Now you will know why the mood among all the private specialist is down over the last 2-3 months. For me, the introduction of U56 is just to say that you are not going to get JUSA C anytime soon or even forever! The government is also planning to expand their Full Paying Patient scheme to more hospitals as another form of encouragement for specialist to stay in the government sector. I still remember almost 11 years ago, I was one of the SCHOMOS committee member involved in this discussion to introduce FFP. 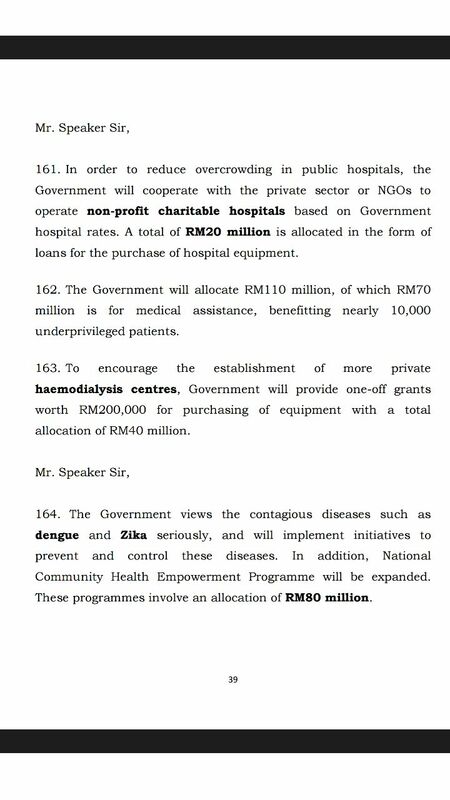 Interestingly, there is also a suggestion in the budget to build “non-profit charitable” private hospital under government initiative. RM 20 Million loan is nothing as far as building a hospital is concerned.I wonder how long will that last unless the government comes up with a National Health Financing scheme…… How a private hospital is going to survive with government hospital rates? Isn’t that what the government is doing with government hospitals? Sometimes I don’t understand all this populist ideas which most of the time never happens. Anyway, government servants will receive RM 500 bonus and no income tax reduction as promised. He did promise few years ago of a gradual personal income tax reduction when GST is in full force. AND what happened to “janji” of reduction in car prices? Janji dicapatikan, I guess. Finally, today’s BUDGET speech in Parliament felt like a election public rally! Why do we need all the “public” icons to be made present and introduced? First time in the history of Malaysian Parliment! I give up some times! On this auspicious Tamil New Year 2016, after almost 6 months of writing and another 4 months of publishing process, finally my first book is out! I started to compile my articles into a book in June 2015 and completed it in November 2015 before sending it to publisher (Snappars Publishing). It took another 4 months of editing, proof reading and type setting before it was finally printed. The book will be officially available from 15/04/2016 (only online at the moment).You can also visit http://www.hardtruthsofbeingadoctor.com if you wish to buy using credit card/pay pal. At the moment, these books will be sold as a set of 2 books , only via this blog and my Facebook. For Future Doctors: The Waiting game continues…………. Day by day, the waiting game seem to be getting more interesting. Right from the beginning of this year, we knew that fresh graduates are waiting for a period of 4-6 months to get a Housemanship post. We also know that MOH has stopped any foreigners, even if you are married to a Malaysian from getting a Housemanship post. I know a person who spend time and money sitting for MQE last year only to be told to take SPM BM paper in order to get a job. She went on to do her SPM BM paper and passed ( she is an Indonesian). Unfortunately, after going through all these hurdles, she was yet again told that jobs will not be given as they do not have enough post, even for Malaysians. Today, our DG aka Chairman of MMC has issued a press statement. The statement says that due to long waiting time to start Housemanship, provisional MMC registration will ONLY be given once your job and posting is confirmed. Till then only a letter stating that you are eligible for provisional registration will be given for submission to SPA/MOH. This basically proofs once again that more and more housemen are being retained for poor performance and competency which is making the waiting period even longer day by day. By 2016, all medical schools in Malaysia will be producing graduates. This will further increase the numbers which will create a bottle neck into housemanship. As I predicted almost 5 -7 years ago, the year 2016/17 will be the year when this will happen. We will be flooded by medical graduates! The Star went a step further by saying that all medical graduates will be screened before being offered a job. I feel they interpreted it wrongly. All graduates have to undergo SPA/PSC interviews before being employed into civil service. It is a standard procedure. It is nothing new but the The Star make it look like it is never done before. The statement by DG is quite clear that Provisional Registration will only be given once your job and posting is confirmed. The only hidden message I can sense is that ” job may not be guaranteed” soon! Now, didn’t I say so! Majlis Perubatan Malaysia (MPM) dalam mesyuaratnya yang ke-347 pada 15 Disember 2015 telah membincangkan dan mengambil maklum bahawa semua graduan perubatan perlu menjalani temuduga yang dijalankan oleh pihak berkuasa Suruhanjaya Perkhidmatan Awam bagi tujuan mendapatkan pekerjaan sebagai Pegawai Perubatan Siswazah (Gred UD 41). 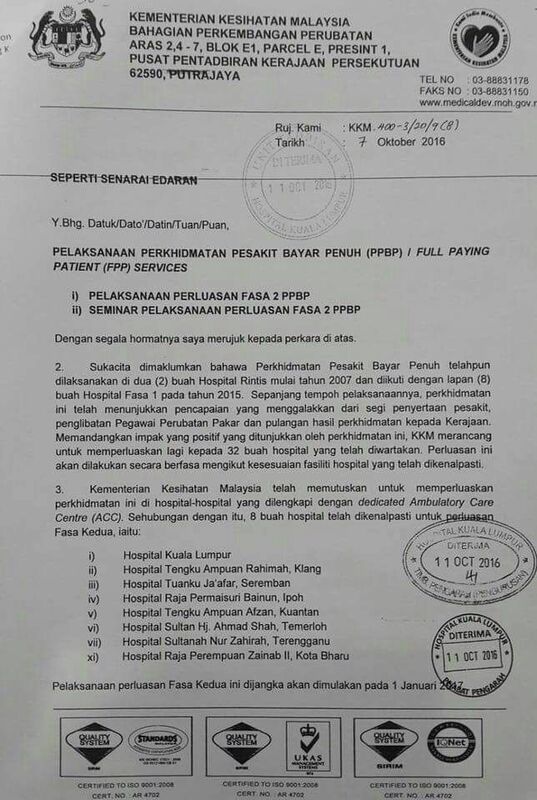 Mesyuarat juga mengambil maklum bahawa pada masa kini terdapat sejumlah Pegawai Perubatan Siswazah yang sedang menjalani latihan siswazah di hospital-hospital Kementerian Kesihatan Malaysia, gagal menyempurnakan latihan siswazah dalam tempoh yang ditetapkan dan terpaksa melalui pemanjangan tempoh latihan oleh kerana pelbagai sebab; antaranya adalah masalah kompetensi dan juga masalah kesihatan. Pemanjangan tempoh latihan siswazah telah menyebabkan ‘backlog’ Pegawai Perubatan Siswazah yang sedang menjalani latihan di hospital dan telah menyebabkan kemampuan untuk mengisi kekosongan jawatan gred UD 41 bagi tujuan latihan menjadi amat terhad. Keadaan ini menyebabkan graduan perubatan terpaksa menunggu bagi tempoh yang lebih lama bagi mendapat peluang untuk dilantik menjalani latihan siswazah. Proses pengeluaran Sijil Pendaftaran Sementara kepada graduan perubatan diselaras dengan keperluan Seksyen 12(1)(b) Akta Perubatan 1971, iaitu Sijil Pendaftaran Sementara (Provisional Registration) bagi tujuan menjalani latihan bagi memenuhi keperluan di bawah Seksyen 13 Akta Perubatan 1971 hanya akan dikeluarkan kepada mereka yang dapat menunjukkan bukti bahawa mereka telah dipilih dan ditawarkan untuk bekerja sebagai Pegawai Perubatan Siswazah (Gred UD 41) bagi memenuhi sebagaimana peruntukan Seksyen 13(2). Sehubungan dengan itu, tatacara pengurusan permohonan Sijil Pendaftaran Sementara bagi memenuhi keperluan peruntukan Seksyen 13 telah dikaji semula, di mana semua permohonan yang layak akan diberikan satu surat memaklumkan bahawa mereka layak dipertimbangkan untuk Pendaftaran Sementara dan tertakluk kepada mereka dipilih dan ditawarkan jawatan Pegawai Perubatan Siswazah sebagaimana yang diperlukan di bawah Seksyen 12(1)(b) Akta Perubatan 1971. Sijil Pendaftaran Sementara bagi membolehkan mereka menjalani latihan sebagai Pegawai Perubatan Siswazah di hospital KKM hanya akan dikeluarkan setelah graduan berkenaan mengemukakan surat tawaran bahawa mereka telah ditawarkan jawatan Pegawai Perubatan Siswazah. Penyelarasan proses pengeluaran Sijil Pendaftaran Sementara kepada graduan perubatan dilakukan bagi tujuan mengemaskini proses dan juga bagi memastikan pematuhan kepada Akta Perubatan 1971. Merangkap YANG DI PERTUA MAJLIS PERUBATAN MALAYSIA.